Border Patrol agents have found dozens of tunnels near the border of Mexico. 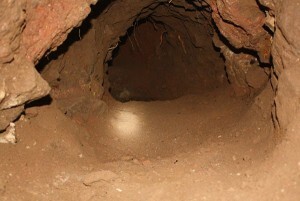 When agents locate the taste underground networks used by Mexican drug cartels, they dump concrete to seal the passageway and stamp them with a date, the New York Times reports. Many of the tunnels are used to circumvent large walls – like the one supported by Donald Trump. Trump has pledged to use sensor to “find and dislocate tunnels and keep out criminal cartels,” but no such technology has proven successful. Posted: 9/2/16 at 9:07 AM under News Story.